Adam Princenthal tells jurors a rear-end collision forced his client, Roy Martin, to undergo a spinal fusion. Lawrenceville, GA—Attorneys Monday debated whether a fender bender delivered career-ending back injuries to a postal carrier, as a seven-figure trial opened against the driver at fault for the wreck. Martin v. Van Horn, 14C-03260-S5. Roy Douglas Martin and Terry Reeves were struck from behind in a low speed crash by Anthony Van Horn, as the couple sat waiting to turn right at an intersection in January 2011. The pair, who ultimately married after reconnecting at a high school reunion months prior to the accident, claim the crash injured Reeves’ shoulder and has put Martin in chronic pain, despite a spinal fusion. 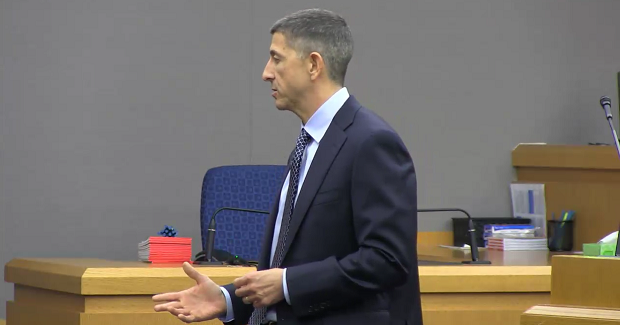 Delivering his opening statement from Reeves’ point of view, Princenthal detailed Reeves’ shoulder injuries, which took 18 months to heal, and said the crash ultimately forced Martin into an early retirement and required a spinal fusion. That surgery, Princenthal said, caused Martin to suffer “failed back syndrome,” characterized by chronic severe pain. The defense counters the crash was too minor to cause Martin and Reeves’ injuries. During his opening statement, Jay Eidex noted the crash did only minimal damage to Martin’s car, yet the couple is seeking about a million dollars in economic damages alone. “Mr. Horn bumped into a man six years ago, tapped him, and here he sits, in Gwinnett County Courthouse. [Defending hmself] over a million dollars, at least,” Eidex said. Trial in the case, in Gwinnett County State Court, is expected to last about four days. CVN is recording the trial and will offer gavel-to-gavel video as soon as possible after the verdict. Roy Douglas Martin and Terry Reeves are represented by Princenthal and May LLC's Adam Princenthal. Anthony Van Horn is represented by Jay Eidex. Learn about CVN's unrivaled library of trial footage, from car crash cases to the nation's biggest products liability lawsuits.